For about a year now I have quietly been planning a 16 Day River Cruise on AMAWaterways. 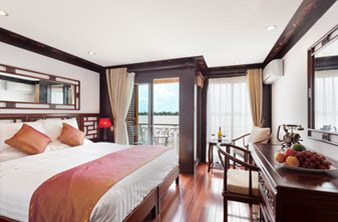 It is the Vietnam, Cambodia and The Riches of the Mekong River itinerary. 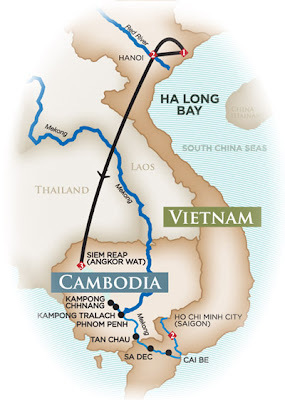 We depart for Hanoi, Vietnam on August 19, 2012 and the date cannot get here soon enough. That said, as an introduction to our adventure, let me give you an overview. You fly into Hanoi, Vietnam, then go to Ha Long Bay and overnight on a luxury junk, fly to Siem Reap, Cambodia, embark the AMALotus river cruise ship, cruise down the Mekong River, disembark and travel to Ho Chi Min City (Saigon) before departing back home. OK, let's face it: You have no idea where these places are, how to orient (pun intended) yourself, what you do when you get there or if it these places could possibly be of interest. I am with you...except for one thing: This is my job, so I better know and if I don't, I better find out! So I am going to "find out" and vicariously take you with me as I do. Second, I need to get my head around that this is not an independent trip nor is it a cruise. This is a Land/River Cruise combination. You can just take the river cruise portion if you like, and I am certain there are some that will, but for the life of me I cannot see how that really makes much sense. Let me give you an example: An older client of mine was interested in the river cruise portion, but wanted to spend time in Thailand beforehand and fly into Siem Reap. Doable, but why? So I asked him if he was interested in Ha Long Bay...but he never had considered it. After a bit of thought, he was. But just that, so could he do it independently? Now logistics came into play and that isn't quite so easy. So then he thought of a Seabourn cruise (they have a really great itinerary, by the way). But then you miss the entire Cambodia and Mekong River (interior) aspects. Then I said, "How can you fly into Siem Reap and not go to Angkor Wat?" He agreed, but then the logistics, private guide, etc. came in. And then the final issue: His wife loves him, but she also loves other people; while he is happy to sit on deck and relax. And from there the full Land/River Cruise booking was made! Third, before I get into the details of the itinerary (which you can see by following the link above...or my comments to follow in my next article on this trip), I want to get into the Cruise Documents. AMAWaterways does not have the fanciest of documents, but it is packed with a huge amount of useful information provided in an easy to read, easy to find, format. The white booklet is a Day-By-Day Description (summary and detailed) letting you know when each excursion (all of which are included) departs/returns; what exactly you will visit, length of the tour, amount of time spent walking, bus travel times (if applicable), difficulty (1-5) and what meals are included on tour. While the small Mekong River book is of obvious content, the single page flyer is not. 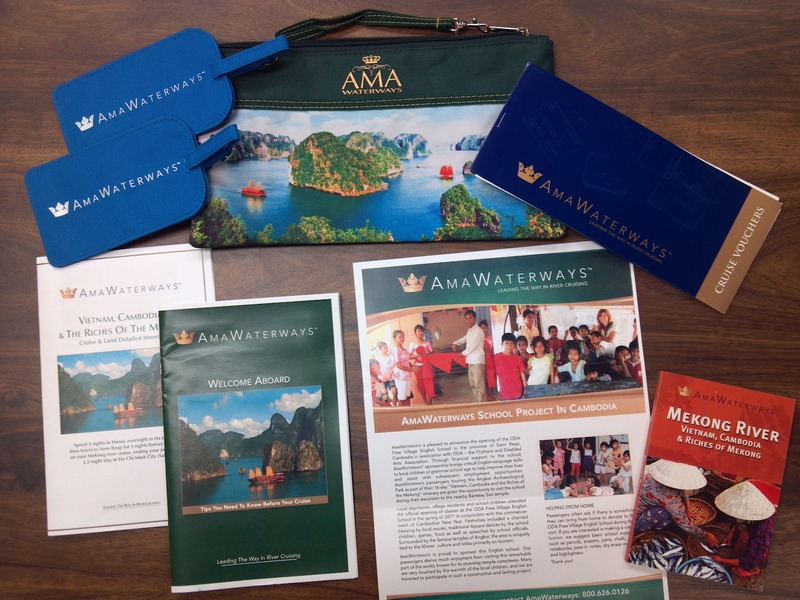 It gives some history about the English language school in Cambodia that AMAWaterways sponsors (and also provides a list of supplies you may donate if you wish). Now, of course, you want to know about that ship: AmaLotus. This 124 passenger ship was launched in 2011. 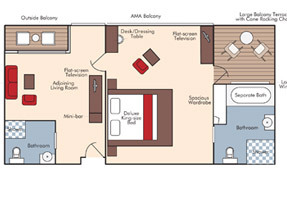 The standard cabin size is 226 square feet and includes a nice balcony while suites range in size from 290 to 624 square feet including two balconies and a separate bathtub among other amenities. There is a small swimming pool overlooking the stern, various lounges and free wifi. Breakfast and lunch are served buffet-style, but dinner is a multi-course affair. Cuisine is both Western and Local with both being offered at all meals. (You know which I will be enjoying...and it will not be hamburger or roast chicken!) Lunch and dinner include house wines, beer and spirits. OK, so now you want the details of the trip and what we have planned? That's in the next article!